I recently read two articles that have catapulted me to action. The first was from the Washington Post. It identifies seven gun laws that would have a powerful impact on reducing gun violence: red flag laws, relinquishment laws, assault weapons bans, high-capacity magazine bans, gun possession prohibitions for high-risk individuals, gun possession prohibitions for individuals with domestic violence convictions and mandatory background checks. In the article (you can access it here) the journalists, Leslie Shapiro, Sahil Chinoy and Aaron Williams, have created a grid that shows which states have these laws and which do not. My vision for change is simple. My vision is to have grandparents and grandchildren work together in their own state to get these seven specific laws in place in their state. We will simultaneously to work to have these seven laws enacted as federal laws. As veterans, we have first-hand fear and knowledge of what it feels like to be shot at. Many of us fought in wars: World War II, Vietnam, the Korean War, the Gulf War. We were trained to love our guns. We were trained that our gun was our best friend and protector. We were trained to kill. We also saw the pain and death caused by guns. During WWII, in homes where a husband or son was killed in the war, there was a gold star on a pennant in their window. That’s how you knew. Violence affected our communities and we were scared. Just as we are scared now. We need to change gun laws. 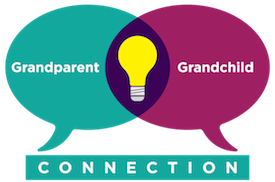 We, the grandparents, are so inspired by the voices of young people who are taking action. Who are speaking out. We love that some have connected with organizers of #metoo and the Women’s March to collaborate, build coalitions and raise their voices to a scream. Yet even a scream is still not loud enough. 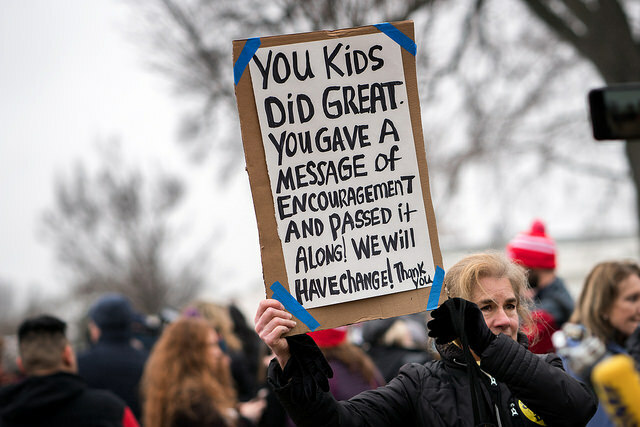 We want to stand with our grandchildren to amplify their voices. We already vote, as they will soon, too. We often know our local politicians. We have been active. We have donated to political campaigns. We have a network and connections. We are vocal. We can help our grandchildren. We can introduce them to legislators who have the power to pass these laws we want passed. We can “get out the vote” for our grandchildren as they run for office. Think of the cultural change they can make in this country. Your grandchild can run for office. In Kansas, Vermont and others right now. There is no age limit on how young (or old) you can be to run for office in these states. Grandparents are afraid. We have seen death. We have felt despair. We are also a sign of hope, having lived full lives in the face of these challenges. And we are guilty. It is all of the generations before our grandchildren who created the gun culture in our society that they must now face. We made it happen, whether deliberately or by not speaking out sooner. We are responsible for helping to make it right. My goal is very specific and very doable. Get all 50 states to adopt the seven laws outlined by the Washington Post: Red flag laws, relinquishment laws, assault weapons bans, high-capacity magazine bans, gun possession prohibitions for high-risk individuals, gun possession prohibitions for individuals with domestic violence convictions and mandatory background checks. Thank god we have a constitution that allows us to do more than shake our fists. Together we can make change happen. My dearest grandchild. I am available Monday, Tuesday, Wednesday, Thursday, Friday, Saturday and Sunday of this week and next. Let’s roll up our sleeves and get started.